Enjoy famous Japanese hot springs in the comfort of your own home! TrueRenu's Japanese Hot Springs Bath Salts Sampler has everything you need to take a hot springs getaway - right in the comfort of you own tub! Not a perfume or bubble bath ... Minerals promote circulation and warmth, intense aromas relax you and last as long as your bath! Sample eight different bath salts reflecting famous Japanese hot springs - each contained in a 25-30 gram foil sealed powder - a perfect way to try them all! Our line of bath salts treat the skin, body and mind. You will emerge from your bath transformed, and believing (as we do) that a bath can heal your spirits each and every day. 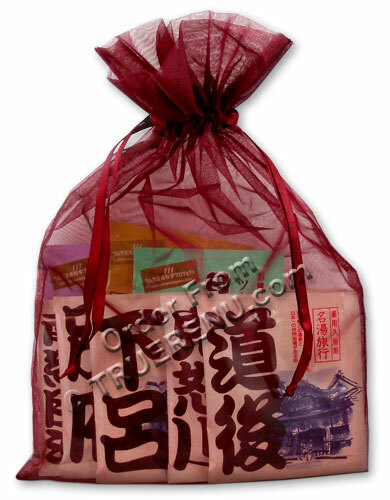 We feature one of the largest selection of imported Japanese Bath Salts. Welcome to TrueRenu and the largest collection of Japanese bath salts available! The Japanese consider bathing a ritual, using varying temperatures, additives and even the time of day to achieve different results. Each Hot Spring product is named after a famous hot spring in Japan, and contains minerals and essential oils to replicate the experience of actually being there. Enjoy the warm, soothing release of stress as your body becomes buoyant and resilient in these wonderful baths. Fill tub with fairly warm water - about 104 Fahrenheit. Add 1 envelope of bath powder to the tub. Submerge yourself above the shoulders, if you can, and stay there for at least 20 minutes. Do not use in wood tub, or jacuzzi whirlpool type baths. Ingredients: (Incomplete) [BEPPO] to come [DOGO] Sodium bicarbonate, sodium sulfate, potassium chloride, precipitated calcium carbonate, silica, cellulose gum, sodium glutamate, FD&C blue NO2, D&C Green NO8, fragrance [GERO] to come[NOBORIBETSU] Sodium sulfate, sodium bicarbonate, titanium dioxide, dextrin, calcium carbonate, silica, potassium chloride, fragrance [NYUTO] Sodium bicarbonate, sodium sulfate, titanium dioxide, dextrin, magnesium sulfate, potassium chloride, calcium carbonate, fragrance, polyquaternium-10, silica [NIGORIGO] Sodium bicarbonate, sodium sulfate, magnesium sulfate, sodium chloride, calcium carbonate, sodium glutamate, titanium dioxide, dextrin fragrance, silica, CI NO 15985 Sunset Yellow FCF, CI NO. 16255 new coccin [NASUSHIBARA] Sodium sulfate, sodium bicarbonate, sodium glutamate, potassium chloride, calcium carbonate, fragrance, silica, CI NO.19140 tartrazine, CI NO.73015 indigo carmine. [NARUGO] Sodium bicarbonate, sodium sulfate, potassium chloride, calcium carbonate, sodium glutamate, polyquaternium-10, fragrance, simmondsia chinensis (jojoba) seed oil, ilica, CI NO.15985 Sunset Yellow FCF, CI NO.16255 new coccin [SHINHODAKA] Sodium bicarbonate, sodium sulfate, sodium glutamate, silica, potassium chloride, calcium carbonate, titanium dioxide, dextrin, fragrance, D&C Green NO8, FD&C blue NO2. [TOWADA]Sodium sulfate, sodium bicarbonate, titanium dioxide, dextrin, potassium chloride, calcium carbonate, sodium glutamate, fragrance, silica, CI NO.59040 pyranine conc, CI NO.73015 indigo carmine [URESHINO] Sodium bicarbonate, sodium sulfate, sodium chloride, sodium glutamate, calcium carbonate, potassium chloride, fragrance, polyquaternium-10, CI NO.19140 tartrazine, simmondsia chinensis (jojoba) seed oil, silica, CI NO.16255 new coccin.